The Vintage Cast Iron Fish Door Stop Wedge by Comfify is a tribute to the one that got away! Fishing and nature enthusiasts will enjoy the fine art sculpting, attention to detail, and dramatic pose of this elegant and appealing home décor must-have item. The eye-catching style and size will earn appreciate comments from guests. This item's good looks are not secondary to efficient function: this cast iron door stop is designed with a gentle but effective angle that is a perfect fit beneath most standard doors. It's also weighty enough to hold doors open without sliding or scuffing. This door wedge includes a padded felt anti-scratch bottom that protects your floor from scratches and preserves the beauty of your home. Note: Review other sculpted door stops, most do not include a protective felt surface! 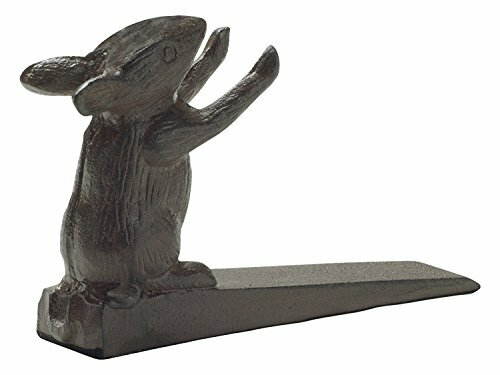 The stylish vintage design and antique finish of the Vintage Cast Iron Fish Door Stop Wedge by Comfify are a great fit for rustic homes, mountain cabins, fishing homes along the lake, and more. Give as a Gift to Your Fishing Friends! Anyone of your family or friends who enjoy fishing and the outdoors will love the Vintage Cast Iron Fish Door Stop Wedge by Comfify as a gift. It's perfect for birthdays, Christmas, retirement parties, or any occasion you want to recognize the joy and fun of fishing. This is a special keepsake and a gift that will be cherished. CLICK NOW TO PURCHASE! Your order is protected by Amazon's A-to-z Guarantee. Amazon Prime members receive FREE 2-day shipping. Enjoy this dramatic nautical-themed door stop for yourself or as a gift for a fishing enthusiast friend!